An impressive discovery of ancient lacustrine settlements and a huge necropolis, dating back as early as 8,000 years ago, has been brought to light by an archaeological excavation in the area between the villages of St. Panteleimon, Anargyros Amyntaiou, and Vegora Philotas in Greece. Although excavations took place in the region more than a century ago, in 1898, by the Russian Institute of Constantinople, nothing was ever reported or announced and excavations stopped for more than 100 years. In 2001, excavations resumed in the area due to lignite mining operations by the Greek Electricity company, leading to the accidental discovery of the ruins by a group of workers. Since then, an incredible 54 ancient settlements have been discovered with 24 discovered in the last two years alone. The details of the findings have just been reported by an archaeological representative of the Government. The discoveries include the remains of numerous rectangular buildings, measuring 4x6 metres and oriented southeast to southwest, arranged in ‘neighbourhoods’ of 4 to 6 buildings in each. The floors of the buildings were constructed with successive layers of clay resting on wooden beams. Some of the larger buildings consisted of two levels with a balcony on the second floor, demonstrating remarkably advanced architecture for the period between 6,000 BC and 3,000 BC. Inside the buildings, archaeologists have found the remains of fireplaces, which would probably have been used for both heating and cooking. In order to avoid flooding they had created fortifications to protect the settlements. Each house was raised on layers of clay to avoid water gathering beneath. Many tools, pottery, various jewellery and clay figurines were found including anthropomorphic and zoomorphic representations. One of the most impressive artifacts was a chair with legs (as opposed to a seat with a solid base), which until now had only been found in Greece dating back to the 6th century BC. The findings also shed light on the dietary habits of the ancient people, as scientists have found the remains of wheat, lentils, and pomegranate, as well as blackberry and elderberry seeds. 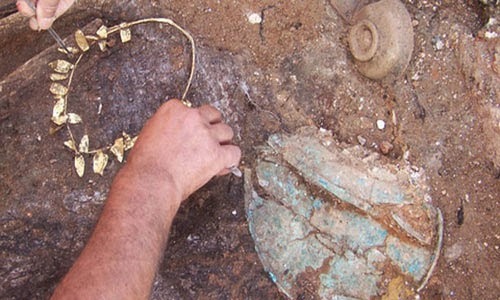 Archaeologists discovered jewellery, pottery and many other artifacts. Photo source. The civilisation that occupied this area has since been named the ‘Civilisation of the Four Lakes’, as most of the settlements were found in the vicinity of a set of lakes in the region. The civilisation is believed to have settled in the area beginning around 6,000 BC and extending until 3,000 BC. It appears that a great fire destroyed the settlements, with many remains becoming submerged in the depths of the lakes. The necropolis that was found consists of cist graves in an entirely circular and radial arrangement with each tomb accompanied by a large number of offerings like ceramic and bronze vases, jewellery, clothing, weapons and tools. More than 148 tombs have been found to date. The discovery of the remains of some women wearing elaborate clothing and valuable jewellery indicates the existence of a hierarchical social system. 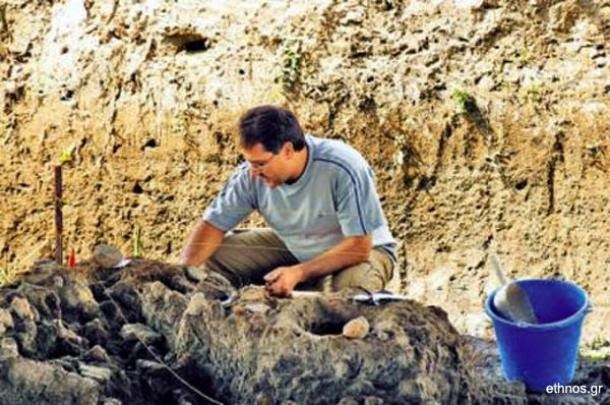 The discovery reflects an incredibly advanced civilisation existing in northern Greece 8,000 years ago.